A little while back I wouldn’t even have been able to answer the question “what is a vegan?” confidently, and I certainly haven’t converted to being one recently. So what right do I have in writing an article on vegan picnic food? Well, if truth be told, as long as I can educate myself on a subject I can write about anything I please. But the real reason I decided to write a vegan picnic article was because I saw there was a need for one. I recently invited a colleague out for a picnic and was surprised when he informed me he was a vegan. Yeah, he didn’t have horns and a tail, seems you can’t tell if someone’s vegan just by looking at them. I just nodded nonchalantly and said, “no probs”, not really understanding what he had just told me. I knew it had something to do with not eating meat, but not the full extent of what it means to be a vegan. Surely you’ve all been a bit of an idiot like I was and pretended you knew what something meant instead of asking for clarity? And it’s at times like this we all know Google is our best friend when needing answers. Well that’s five hours of my life I’ll never get back, and yes, I’d only have wasted them anyway. But not only did I now know what a vegan was, I also knew there was very little info or good resources for vegan picnic food. So I bit the bullet and confessed my stupidity to my colleague and with his help came up with this list of great vegan picnic food ideas. There are also several different sub-sections of vegans, such as whole-food, junk-food, raw-food, low-fat and dietary vegans. All of whom adhere to the no animal exploitation or cruelty rule for their food, but each having their own twist in what they will eat from the food groups that are left. So be sure to ask before making several dishes that’s not what they eat. This is the play it safe option. Bring along an assortment of nuts, dried fruit, breadsticks, crackers, dips, crisps, cakes and chocolate. With these snacks you’ll have all your bases covered. And even though all the listed foods are vegan-friendly, if your picnic party has vegetarians or “I’ll eat anything” people, they too can enjoy these treats. Our aim as chefs for a vegan picnic is vegan food, but the non-vegans at the picnic don’t need to know this, and nachos are a great picnic dish for everyone. 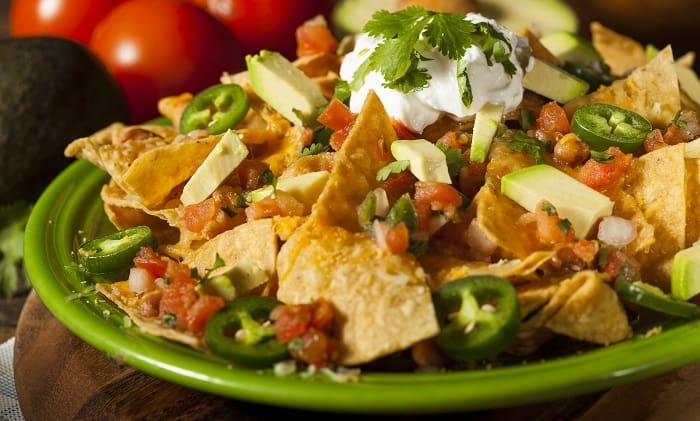 Tortilla chips, spicy salsa, guacamole, refried beans and jalapenos are just a few of the amazing vegan edible items you can use for a wonderful plate of vegan nachos. And at a picnic you can’t go wrong with nachos. They are easy to store and carry to a picnic and they’re great for sharing. Head over to SeriousEats.com for the best recipe and topping choices I’ve seen for vegan nachos. Although it has become commonly accepted to refer to sushi as raw fish this isn’t actually the case (Sashimi is the raw fish that often accompanies sushi). So it might surprise you to find out you can make sushi with vegetables and even with fruit.